Hypocrisy may be the only consistent guiding principle of US foreign policy. Here’s a prime example of the “do as we say, not as we do” that is the core of how Washington does business overseas: In the same week that the the US Justice Department demanded that the Russian-backed RT America network register as a foreign propaganda entity or face arrest, the US State Department’s Bureau of Democracy, Human Rights and Labor (DNL) has announced that it is launching a program to massively interfere in NATO-partner Hungary’s internal media. So the US Justice Department is cracking down on RT America for what it says is manipulation of US domestic affairs while the US State Department announces a new program to manipulate Hungary’s domestic affairs. The State Department’s new program would send three-quarters of a million dollars to Washington-selected Hungarian media outlets to “increase citizens’ access to objective information about domestic and global issues in Hungary.” On what authority does the United States pick winners and losers in Hungary’s diverse media environment? Since when does one government have the right to determine what news is “objective” in another country? Hungary is not a country to be “regime-changed” — it is a full democracy where the will of the people is regularly expressed at the ballot box and where the media competes freely in the marketplace of ideas. The State Department’s Bureau of Democracy, Human Rights, and Labor identifies its mission in this call for grantees as “promoting democracy and protecting human rights globally.” So what is it doing in Hungary? Hungary has had nearly three decades of democracy since 1989 and hardly needs the United States to tell it what kind of media is allowed (subsidized) and which kind should be suppressed. In reality this is a US government program to ensure that the Hungarian media follows Washington’s policy line. Hungarians are all too familiar with this kind of toxic interference from an outside superpower: it was called the Soviet Union. Does Washington really seek to take on that role? This US government intervention in Hungary’s internal affairs must feel like a stab in the back to Orban and his government. Orban was an early — and rare — supporter of candidate Donald Trump among his European colleagues. Indeed, where Brusssels saw Trump as a gauche loudmouth, Orban openly admired the soon-to-be-president’s position on immigration and particularly on the mass immigration of mostly Muslim “refugees” that has proven to be disastrous for so many European countries. Likewise, Viktor Orban’s Fidesz party has managed to retain a high level of popularity through two election cycles by embracing and promoting the kind of nationalism that characterized Trump’s successful campaign. Orban’s early support for Trump appeared to have paid off. 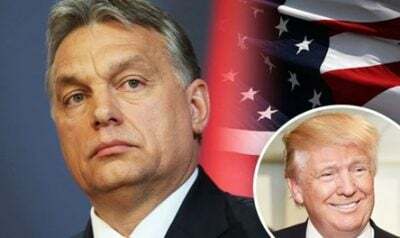 Where Fidesz had struggled to make any headway at all under GW Bush or Obama’s State Departments, both of which were openly hostile, one of President-elect Trump’s first moves was to invite Orban to the White House. Orban, for his part, hailed Trump on inauguration day, welcoming in an era where national interest takes precedent over multilateralism. Then Trump’s State Department launched a program to undermine Hungary’s national sovereignty by interfering in the Hungarian media market. It seems national sovereignty is a one-way street for Washington no matter who occupies the Oval Office. But perhaps it’s inaccurate to accuse the US government of hypocrisy in this case. After all, pressuring RT America with the intent of silencing the news network and spending our tax dollars propping up US-friendly media outlets in the Hungarian countryside are actually two sides of the same coin: the US government will tell you what kind of media you are allowed to consume. If you are a media network in the United States that allows voices who oppose Washington’s neocon-dominated foreign policy they will shut you down. If you are a news outlet in the Hungarian countryside that spews the US party line, they will prop you up. Both cases are the same: your media will toe the US government official line or else. Note to Viktor Orban: You risked arrest — and worse — in June, 1989 when you directly confronted the communists who were occupying your country. Now that Hungary’s freedom has been won — in no small way due to your efforts — do not allow Washington’s neocons to take it away from you! If you do not confront this violation of Hungarian sovereignty, the neocons will continue to increase the pressure. The neocons want you out! Just this week, neocon commentator Anne Applebaum wrote that you are a “neo-Bolshevik” who has “little to do with the right that has been part of Western politics since World War II, and…no connection to existing conservative parties.” Do a little research and you will notice that Applebaum is a member of the International Advisory Council of the Center for European Policy Analysis — the organization your own government funded for a big conference this summer! Neocon knives are out for you. You’d be smart to make a better assessment of who are your friends and enemies in the United States…before it’s too late.